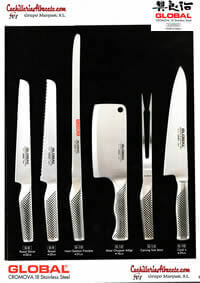 Peeler knives, tomatoes, cheese, saw, serrated, fish, birds, lobster. 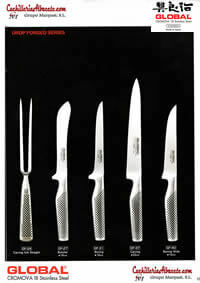 Cheese knives, santoku, cutter, kitchen. 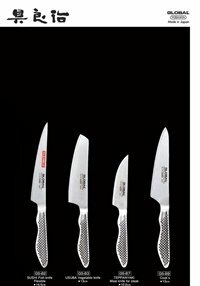 Chef Knives and knives cut vegetables. 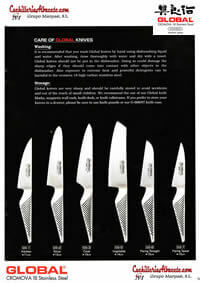 GLOBAL knives are made in Nigata (Japan) by the company Yoshikin. 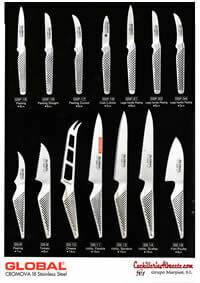 They are designed by Komin Yamada, are knives with modern design and innovative. 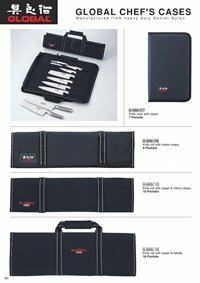 In its manufacture the finest materials are used. 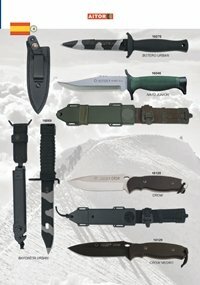 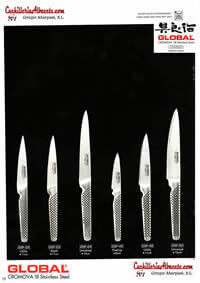 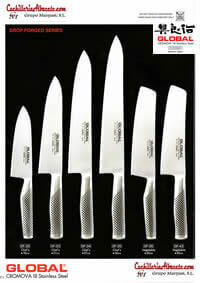 His collections of kitchen knives, known for their ease of operation and ergonomics. 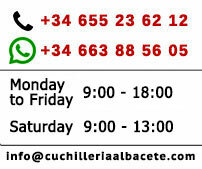 Are directed to both professional and amateur use. 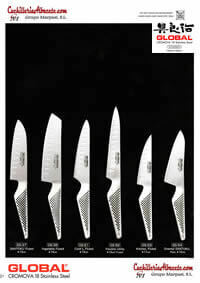 The edge of GLOBAL knives, is concave and not as a V. In this way, you get a lot more durable and sharp at the same time a better sliding the knife through the food to be cut. 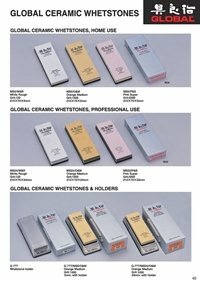 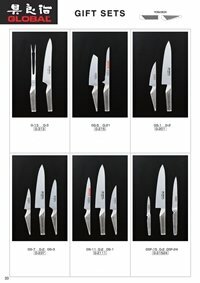 The GLOBAL sharp knives are achieved in a completely handmade. 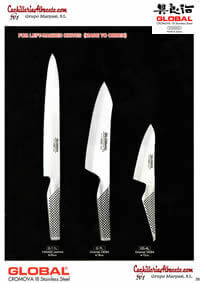 GLOBAL knives are made ​​from the finest stainless steel. 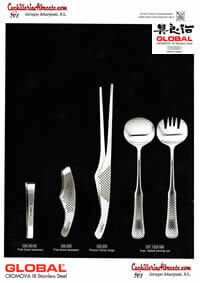 To make the leaves is used CROMOVA 18. 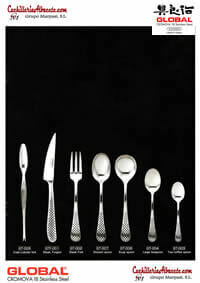 With 18% the percentage of chromium is in the steel. 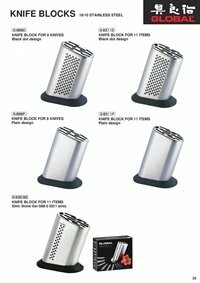 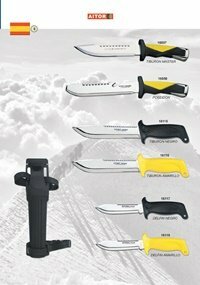 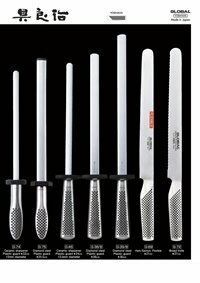 This gives sufficient hardness for the steel knife that stays sharp longer than the competition, not being an excessive hardness, so that it is very difficult to sharpening. 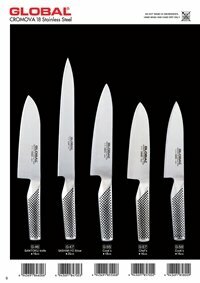 GLOBAL knives are ice tempered and hardened by a process called Rockwell, whereby the sheet is subjected to a temperature of 56°C - 58°C, which gives these knives, a cutting edge over the blade length done with another steel. 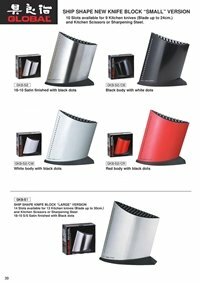 It also makes it very resistant to rust stains and any particularly to corrosion. 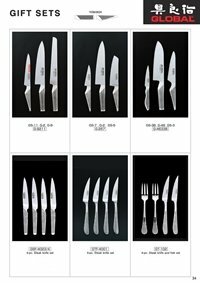 GLOBAL knife is very light and narrow blade, as compared with the knives of the western tradition. 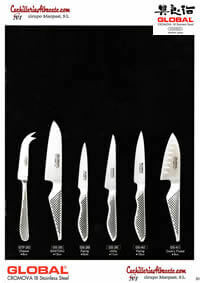 So it makes the knife slips and penetrate better through food. 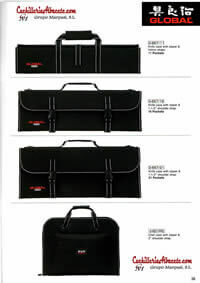 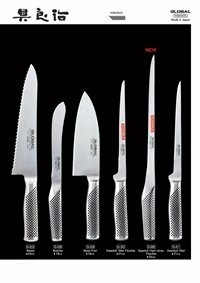 Its smooth contours and seamless manufacture, offer the ultimate in safety and hygiene. 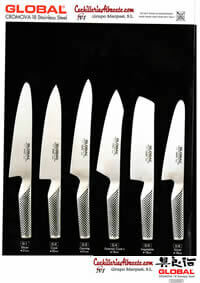 GLOBAL knives give distinction to the chefs, both professional and amateurs. 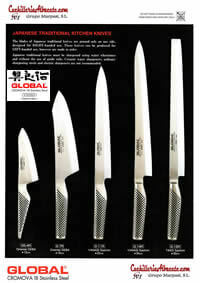 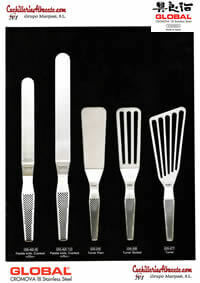 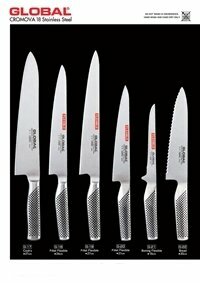 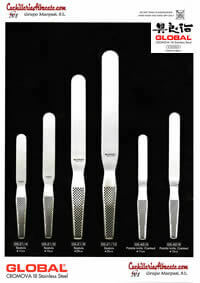 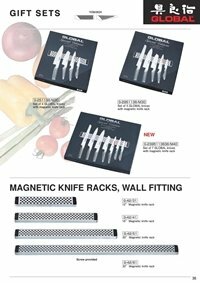 GLOBAL offers special knives, for each of the functions that are performed on a culinary preparation.